After a few weeks of looking like the China market might just roll over and signal a move down in the market, the Shanghai Index jumped solid back into positive technical levels. Copper and oil have broken out as well so it appears that October is set up for some gains in the stock market as well. The two smallcap China stocks we own, Puda Coal (PUDA) and Lihua International (LIWA) also appear to be getting a bid. Makes us more encouraged to look at a China IPO tomorrow. More on that as the story develops. While the 'experts' expected a slight dip in the Chicago PMI to 56 from August's reading of 56.7 the number actually jumped significantly to 60.4. This backs our view that the economic data that slowed during the summer began picking up pace in September. Again another reason why the Consumer Confidence data is virtually worthless and a lagging indicator these days. With manufacturing data soaring along with the stock market, how could consumers be so pessimistic? The PMI numbers were very bullish with orders and activity soaring and inventories remaining neutral below 50. Employment ticked up to 53.4, but sill way below the growth in activity. Good sign for corporate profits. This morning's rumors were right! The Chicago PMI did come in well over expectations, at 60.4 in September vs. August's 56.7. The reading relative to August points to accelerating growth this month, at least for businesses in the Chicago area. It appears that this market can't even pull bulls along kicking and screaming. New report from Mark Hulbert (the expert on contrarian sentiment data from newlettes) shows that most advisors continue to doubt this rally. Appears that short term market timers are only recommending 22% of clients equity portfolios towards domestic stocks. That's down from 52% around the market top back in early May. While this is a short term 1-3 month indicator, it does show that advisors remain a lot more bearish then one would think considering the market rally during September. Clearly most advisors now worry about a October sell of and so the only path might be up. Regions Financial (RF) hasn't had a huge reaction to such speculation because it's been a common myth so far that the regional banks would be buyout targets. So far nothing has happened in this sector so the market has been lulled to sleep. Likely on the new financial regulation in the US not to mention Basel III has limited the desire of banks to go on acquisition sprees. This might change in the near future so the speculation by Credit Sussie is likely logical. 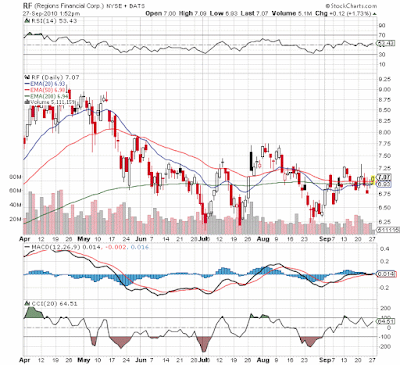 After all the Canadian Banks such as Toronto Dominion (TD) and Bank of Montreal (BMO) are relatively strong and would likely relish the opportunity to buy an American bank on the cheap. The price is likely a sticking point. Canadian Banks aren't likely to pay up and regional banks such as RF won't part with shares on the cheap. RF currently trades anywhere from 20-50% below book value depending on what number you use. Are Canadian Banks willing to pay a multiple of BV? Typically buyout news can be very bullish for the industry and competitors of the firm bought. Potentially less focused competition or even a higher premium for stand alone operators can be very positive. In the case of the airlines, that usually isn't the case. As soon as one airline leaves, another usually is born to take their place. Despite being a long term losing industry, airlines seem to never lack for new entrants. Haven't posted much lately in the 'Future Stat of the Week' column, but that's something I plan to post on more going forward. To determine the direction of the, it's crucial to foresee where the direction of economic data is headed and whether economists have accurately updated expectations. For this week, the key economic stats are the manufacturing data of the Chicago PMI and ISM Manufacturing. Secondary are the consumer confidence reports of the Consumer Confidence Inex and the final University of Michigan Sentiment Index. While all of these numbers are expected to be lower in Sept then Aug, the Manufacturing numbers are sill relatively strong supporting a higher market. The consumer confidence indexes are expected to be lower which could provide an opportunity for an upside surprise. The stock market has been historically strong this September making an assumption of a jump in these indexes as possible. Don't see how they could drop even lower. Looks like Copper is going to break above the 52 week high of $3.6 and likely head back to the $4 range last seen before the financial crisis. Stone Fox has been pushing copper and such stocks as FCX, LIWA, and SLT. The interesting point about copper is that China now controls nearly 40% of demand and the US is around 20%. Assuming demand in the US rebounds it'll be the first time that the 2 biggest users are strong at the same time possibly putting a squeeze on the supply. See previous articles on the issues with supply. Below is a video last night from Mad Money with Tom Collins of TangleTrade Advisors discussing the bullish technicals of copper. Very much backed up by the trade today. Listening to CNBC [Airline Profits Take Off] this morning and there feature on the airlines makes me think its about time to go short. Anytime people get bullish on them its time to get out or go short. US airlines have historically lost money and nothing has stucturally changed. Sure they charge a bunch of extra fees now, but that only offsets the lower ticket prices. There biggest issues continue to be that everybody wants into the industry and every time CNBC does a feature on profits the unions automatically line up for their portion. Airlines can lose billions for 5 straight years and the unions will want new contracts the year they make $50. Though both portfolios ended down for the day, I consider it a great day when they outperform the market by roughly 30 basis points. Its tough to have an aggressive portfolio that beats the market on down days. Especially when the Russel 2000 loses 1.2%. Typically the smaller caps and more aggressive stocks get hit very hard when the market drops nearly 1%. A couple of hedging moves helped reduce the risk after a large run in the markets for the first 3 weeks of September. Shorting lululemon athletica (LULU) in the Opportunistic portfolio has hedged some of the loses from today though Cramer telling people to buy it on his Stop Trading segment yesterday has limited the downside. Also, the Drexion Small Cap Bear 3x (TZA) has been a significant gainer the last 2 days providing huge protection. After a few months of basically stagnant numbers in June and July, the August Leading Economic Indicators (LEIs) jumped 0.3%. Still not a robust number, but one that signals the economy should continue growing at a moderate level. The LEIs are likely the most under followed economic series around. It measures such mundane but very important economic stats such as interest rate spreads, M2 supply, weekly jobless claims, and average hourly work week. The markets sill seem more enamored with housing starts, monthly jobless report, or even the FED minutes. For August the interest rate spread and the M2 money supply made the biggest positive impact. Two numbers not regularly followed by the media and especially small investors. Both signal future growth in the economy especially since the LEIs have mostly been positive this year other then the June minor drop. Definitely nothing that supports a double dip. Copper spikes to $3.55/lb today and is closing in on the $3.6 high from earlier in 2010 and will likely eventually push toward the 2009 high around $4/lb. Copper prices now has the benefit of lower grade production from the top miners [Copper Miners Underproduce Expectations By 6% a Year], high demand from a country like China that has little supply, and a recovering housing market in the US along with a FED that is pushing the dollar lower. All in all the prices for Copper remain very favorable. Even in the face of rising prices this year, inventories continue to plunge at a fast pace. 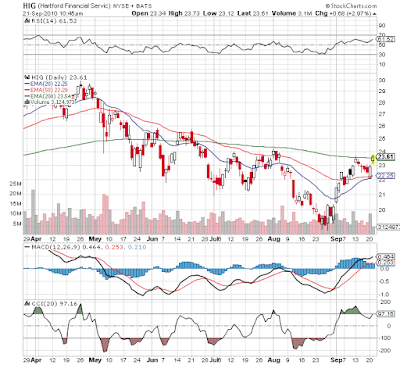 Mainly because top miners such as BHP and Freeport-McMoRan (FCX) continue to struggle to keep up with production expectations due to lower grade of ores. FCX in its recent Q2 conference call forecasted Copper prices just above the $3 range providing huge upside to any guidance they've provided. 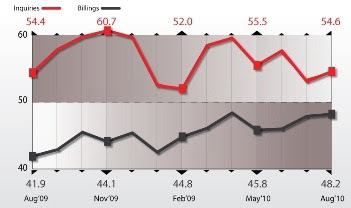 The American Institute of Architects Billings Index (ABI) improved slightly in August. It improved for the 3rd straight month..As a leading economic indicator of construction activity, the ABI reflects the approximate nine to twelve month lag time between architecture billings and construction spending. The score was only 48.2 and still remains below the 50 mark that designates growth in billings. Project Inquiries were a strong 54.6 signaling continued interest in projects. The Index still isn't robust but it has improved dramatically off the bottom. As the market remains in overbought levels, purchases the Drexion Small Cap Bear 3x (TZA) to hedge some of the long positions we have in the Growth, Hedged Growth, and Opportunistic Portfolios. This was done in order to protect and extend capital gains in stock that we expect to continue higher while providing some protection for a downturn back to the breakout levels around 1120 to 1130 on the SP500. With the SP500 only having one major down day in the last 3 weeks, it was just time to hedge. This is on top of a short in LULU and some pruned positions in ICICI Bank (IBN) and Riverbed Technology (RVBD) over the last few days. Now looking at some positions to add to the portfolio on the next drop which we don't expect to be more then 2-3% before the market enters the traditionally strong November to April period of a mid-term election. Of course, you never know with October so keep a close high on whether support holds. At least that's the reasoning for an upgrade by Barclays of Hartford Financial (HIG) to a price target of $32. The stock current trades in the $23s and has a book value over $40 so that's not a huge stretch. Actually anything in the low $30s seems absurdly cheap. Interesting news though to see that big agents that sell life insurance policies are restarting business with HIG. Not sure what took so long as HIG has been financially solid for a while now. Are Buybacks with Cheap Credit Good For Invesotrs? Interesting report on Bloomberg today regarding companies using cheap credit to buyback stock. Our Net Payout Yield Portfolio favors companies with a buyback much more then the general market, but we're not sold on companies borrowing to buyback stock. In our opinion all buybacks should be made from operating cash flow. True, stocks are at historically low PE multiples and interest rates are at record lows providing a compelling opportunity for some financial engineering, but companies should never worsen their balance sheet unless they are investing in a new service or capital equipment that will provide higher earnings in the future. Buying back stock only increases earnings per share but not the total earnings. The company is not better off and in fact is worse off with the higher debt loads. 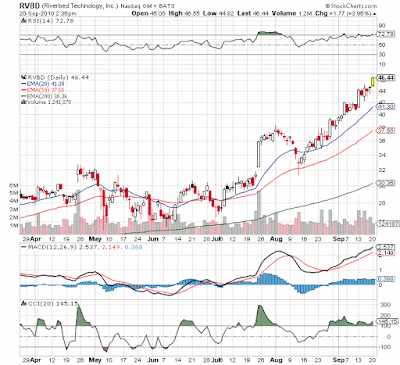 Sold roughly 30-40% or Riverbed Technology (RVBD) in our portfolios after the stock has ramped from $30 to $45 in weeks. RVBD is now trading at over 30x 2011 earnings which is getting pricey. Not that other stocks like Open Table (OPEN) aren't more expensive, but its getting risky to hold onto such huge gains. Still keeping a good percentage of the shares so we're not negative on the stock just the short term valuation. RVBD had become the largest position by far in both the Growth and Opportunistic portfolios so pruning some shares became prudent for diversification purposes. 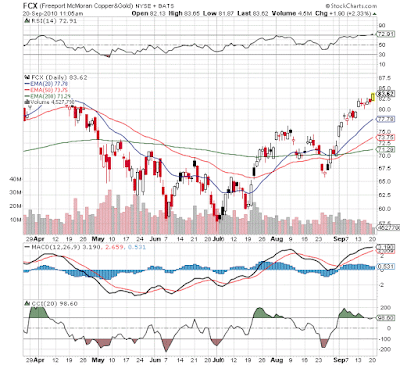 Looking at a chart of Freeport-McMoRan (FCX) and Copper (HGA) it would appear that Goldman Sachs (GS) is a little late to the party. Not that Stone Fox isn't appreciative that GS is pushing up one of our bigger investments. The stock trades at $83 now, but was available for only $57 when July started. Where was GS then? Not to mention that the new target of $94 doesn't provide that much upside from these levels so trade on this news with caution. Copper has also seen a huge rise and is now attempting to breakout and test the recovery highs around $3.60/lb. So again GS seems to have turned bullish long after a run has begun. Now to be fair, the copper inventory situation has become a lot more bullish over the last couple of months. LME copper inventories continue to plunge on a daily basis from 520k tonnes 6 months ago to 382K tonnes today. 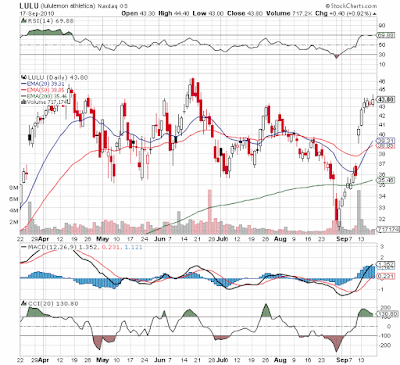 Shorted lululemon athletica (LULU) for the Opportunistic Portfolio mainly as a hedge for some short term over bought stocks. LULU also has a huge gap back to the $37 range so it provides a great opportunity for a stock likely to get whacked if the market sells off. The trade was made around $43.9 and any close above $44 would likely trigger covering this short. Again nothing wrong with the company except being highly priced now at 30x earnings and wanting some hedge for a portfolio still levered at 1.5x. That's the bad news. The good news is that 2011 targets remain intact and the all important met coal market remains strong. After the close last night, Massey Energy (MEE) reported that Q3 production was lower then expected and operating costs were higher then expected. Not exactly an investor friendly combination. Of course that has always been the risk of investing in MEE after the Upper Big Branch explosion in early April as Stone Fox highlighted in July [Buy the Other Disaster Stock]. Management focused on the UBB investigation combined with regulators being extra cautious is never a good combination. Hopefully that will change as the year ends and 2011 starts. Bernie Marcus, Co-Founder of Home Depot (HD), had some interesting words on CNBC today. It's always nice to see somebody say how it is instead of being all political on TV. 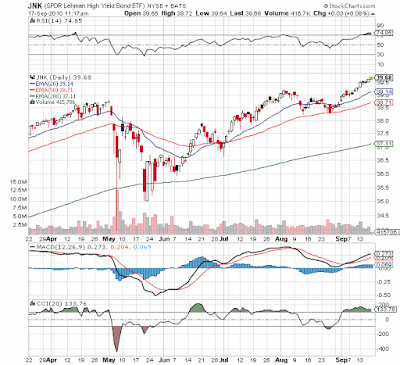 As we've reported in the past, Junk bond funds such as the Lehman High Yield Bond ETF (JNK) continues to rally higher as the stock market pauses at the June and August highs. Sure its people desperate for higher yields then the absurdly low Treasuries and even high grade corporates. The reality though is that it signals too many people placing emphasis on the direction of the stock market has how it relates to the economy. Investors wouldn't rush into JNK unless they were confident of a stable economy. Weakness in the stock market has much more to do with structural changes away from stock investing. This is just another signal that any pause at the 1130 range in the SP500 will likely be short lived. An assault on the April highs of 1220 is likely around the corner towards year end. Texas Instruments (TXN) stock is up some 4% after hours because of an announcement to increase the existing buyback by $7.5B and increase the dividend by 8%. Another example of why Net Payout Yield stocks provide very compelling investments. A company with an expensive stock or one that has very little cash flow could never provide this much money back to shareholders. Also, its very compelling to own a stock that increases the dividend by 8% a year which alone is much better then Treasury Yields with the 10 year below 3%. Thought I'd just pass along the stats from the Covestor Opportunistic Model that has now been live for a little more then 7 months. So far the market has been virtually flat during that period only gaining 2.5% while the model is up nearly 17%. Looks like its adding another 40-50 bps today. This model is a very aggressive model that attempts to make huge alpha via the use of leverage and shorts in addition to the traditional long positions in the Growth Portfolio tracked via Marketocracy.com that has out gained the SP500 by an average 12% per annum over the some 27 months of tracking. See info on the different Portfolio options on the right hand column under Portfolio Management. George Soros is a legendary investor so its natural a good sign when somebody like him buys into a stock in your portfolio in a big way. During Q2, Soros Management Fund bought 1.7M shares of Massey Energy (MEE) for a total position of 2.2M shares. Anybody following this blog knows that MEE hit our radar after its huge drop following the mine explosion in April. See Buy the Other Disaster Stock for more details. MEE remains a very cheap stock having recovered very little from that post explosion drop so far. Soros Fund Management was adding to positions in agriculture giant Monsanto Company (NYSE: MON - News) and energy plays InterOil Corporation (NYSE: IOC - News) and Massey Energy Company (NYSE: MEE - News). The firm also hiked its bet on consumer technology giant Apple (NASDAQ: AAPL - News) and pharmacy CVS Caremark (NYSE: CVS - News). Our Opportunistic and Growth portfolios aim to capture excess returns, but not without some diversification. Limiting portfolio sizes to 20-30 stocks allows for diversification without getting to levels of diworstification. Hence, the portfolios have always had a few 'risky' biotech stocks. Based on the results of Savient Pharma (SVNT) the rewards have clearly outweighed the risks. See previous post. Oh why didn't I include SVNT in the Opportunistic Portfolio???? Regardless the Growth Portfolio has seen some nice out performance demand on the back of SVNT being up 33%. Also noticed that the other biotechs in those portfolios have been perking up of late. All 3 stocks have seemed alot cheaper then the risk involved. 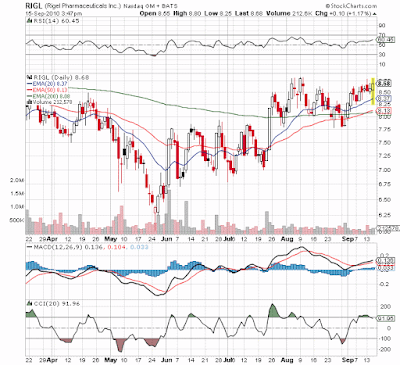 Rigel Pharma (RIGL) and Cephalon (CEPH) have seen bullish trading of late. Not being predisposed to investing in this sector, we just found the valuations too compelling. Yesterday Lihua International (LIWA) confirmed its 2010 guidance of roughly $1.35 per share. The stock currently is having a difficult time holding onto $8. Market clearly doesn't believe the guidance as the company recently double its smelting capacity that should enable growth in 2011 and beyond. LIWA is a leading Chinese developer, designer, and manufacturer of low cost, high quality alternatives to pure copper products, including refined copper products and superfine and magnet wire, as well as copper clad aluminum ("CCA") wire. The Bullish economic news from the last few weeks has completely knocked down the double dippers. Ok, maybe most of the news wasn't overly positive, but it clearly signaled the economy is recovering if even very slowly. With the US economy and even Western Europe at least holding steady, it should allow Emerging Markets to continue growing at rapid rates. Today Atwoods Oceanics (ATW) announces a contract extension with Chevron Australia for the Atwood Eagle ship for 6 months beyond the delivery date of the new Atwood Osprey. This move is notable for a couple of reasons. First, demand must be improving considering that Chevron is willing to employ both ships during the initial 6 month period as opposed to just transitioning to the new ship. It also helps the financial outlook for ATWs as it keeps one of their biggest ships working for another 6 months. This now places it on contract through roughly the end of Q3 2011 leaving a long time to contract the ship out with a new customer. Atwoods currently only has 3 deepwater ships and a 4th to go into production in 2011 that earn more then $400K+ a day so its crucial that they be working. 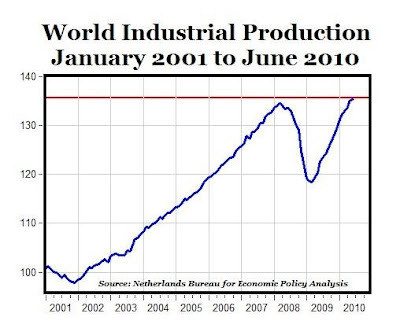 Amazing that while most people fretted about a double dip during the summer, World Industrial Production hit an all time high eclipsing the record high from back in 2008. Clearly people focusing on a double dip are stuck on the lackluster US Housing market and not the global economy. Mark Perry provided this graph via the Netherlands Bureau for Economic Policy Analysis. Mark does a great job pointing out the facts surrounding global growth and this is yet another example of how economic data and graphs so much more useful then the talking heads on TV. Show me the facts not the spin! ICICI Bank (IBN) shot up 6% today placing the stock in a severe oversold position. Hence considering the market being up 8 of the last 9 days, Stone Fox used the jump to unload our stock in IBN in the Opportunistic Portfolio. The more long term focused Growth Portfolio cut back its position by roughly 15% as well. IBN still has long prosperous future ahead, but the market and particular the stock were ahead of itself short term. 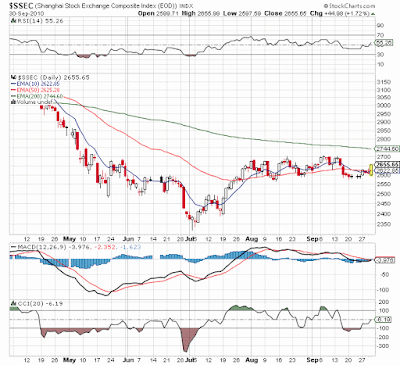 The RSI was an off the charts 82 and the CCI hit 262. Both numbers that can typically signal a short term top. Hopefully the stock will swoon back to the low $40s soon and we'll re-enter the position. 2:20 Update: Trade was just below $48. So far the stock and the market have held up better then expected from over bought conditions. Would imagine the stock does dip back to mid $40s, but at some point i'd expect a breakout above the current ranges in the SP500 to leave a lot of people expecting a pullback that doesn't happen. Revenue: $3.62 – $3.78 billion, compared with the prior range of $3.55 – $3.85 billionEPS: $0.66 – $0.72, compared with the prior range of $0.64 – $0.74. Lets analyze the facts: The revenue mid-point was $3.7B before and now its $3.7B. The EPS mid-point was $0.69 before and $0.69 after. The average analyst estimate is $0.69 and TXN reported $0.62 in Q2. How did I forget Terremark Worldwide (TMRK) on previous post discussing 52 week high stocks in our portfolios. TMRK is a leading investment in both the Opportunistic and Growth Portfolios. Ironically this stock hit a 52 week high back in August, then sold off big time. Whether this will be a breakout this time or eventually fail is still up for debate. TMRK is caught up in the 'cloud computing' craze as it is a prime provide of cloud services in its data centers. Its interesting to note that Rackspace Hosting (RAX) is also breaking out today which has been unusual for these 2 stocks to trade in tandem. So much for the market trading in a herd and stock picking going out the window. RAX on the other hand hasn't broken its high from the beginning of the year. Its a much bigger company so potentially TMRK is being seen by the market has a takeover candidate. 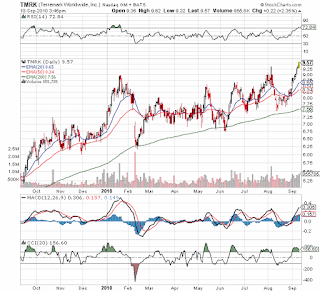 Both stocks and especially TMRK has become overbought and likely needs to take a break prior to advancing above $10. Everybody claims it's not a stock picker market because all stocks are theoretically trading together due to ETFs. Not sure what explains why some stocks are hitting 52 week highs and others are lagging. 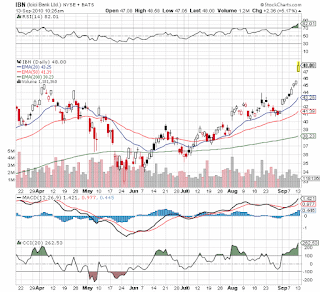 Other then Riverbed Technology (RVBD) which has consistently hit new highs recently, Millicom Cellular (MICC) and ICICI Bank (IBN) are at or approaching 52 week highs under the radar. What do these 2 stocks have in common? Mainly a focus on business outside the US in fast growing markets. MICC is a leading cellular provider in Latin America, South America and Africa. They operate in 14 locations in these fast growing areas providing much more opportunity then any domestic operator. 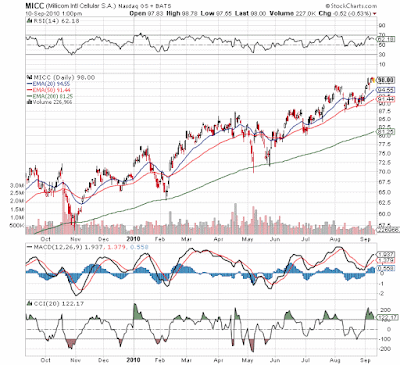 MICC has continued to slowly creep up even during a flat to down market the last 4 months. Almost a perfect chart. This naturally has huge implications to the stock market from now until the November mid-term elections. The market will continue to rally in whats suppose to be a typical weak Sept - Oct period if the odds remain above 70% of the Republicans taking the House of Representatives. Intrade.com is the website where people bet their own money on outcomes such as elections. Right now you have to pay $72 to get $100 if the Republicans take the House. That's actually a lower % then I'd expect at this time. Anyway, as that number goes up the market will surely follow. Anything that pushes Obama towards the center that leads to him talking about business tax credits versus cap and trade taxes will be bullish. Below is the current chart. As they say, people putting their money on the line are likely a lot more accurate then people on TV spinning the results whichever way suits their employer. Something definitely worth watching.